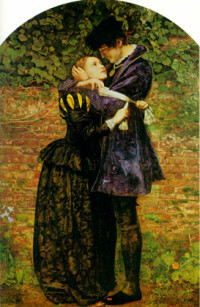 John Everett Millais was one of the founders of the Pre-Raphaelites. He was born in Southampton in 1829; considered a child prodigy, he was sent to Sass's Art School and won a silver medal at the Society of Arts at the age of 9. He became the youngest student at the Royal Academy Schools in 1840, first exhibiting at the Royal Academy in 1846 with his painting "Pizarro Seizing the Inca of Peru". It was at the Academy that he befriend William Holman Hunt and Dante Gabriel Rossetti, who would form the Pre-Raphaelite Brotherhood in 1848. 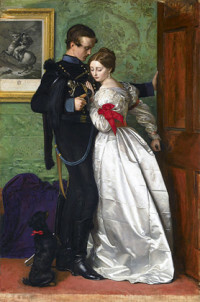 Millais was made an Associate of the Royal Academy in 1853 and a full member in 1863. He was created a baronet in 1885 and was elected President of the Royal Academy one year later. He died shortly after his election and is buried in St. Paul's Cathedral.